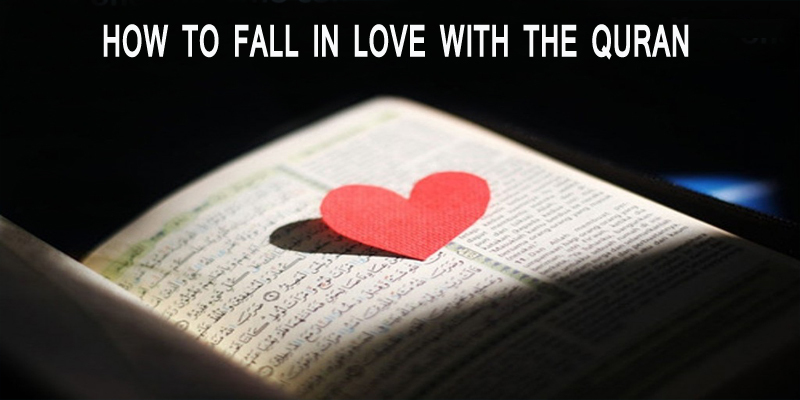 WHAT CAN WE DO TO FALL IN LOVE WITH THE QURAN? Carve out some time in your schedule and relax. Think of your life and the hereafter. Think of the attachment you have for the Quran and think about what can you do in order to fall in love with it. Make a list. Just reciting isn’t enough. You need to know the meaning of what you are reciting. If you aren’t good at Arabic, pick a translation in your language and have it at your side when reciting. Trying to understand what you are reciting is a key factor to increase your love for the Quran. Engage your senses in exploring the contents of the Quran. Feel when you read, and ponder the verses. You should have a feeling of trembling when you come across the verses of warnings, happiness when you read the verses of glad tidings, and sadness when you hear about the torments. If you can feel the Quran, then you will fall more in love with it. Search for more facts from the Quran. The more you search, the more beautiful and inspiring verses you will come across. Jot down the verses and your thoughts if necessary. You will soon learn how the Quran wisely holds the truth. Memorize the verses that interest you. The more you memorise, the more interested you will become until eventually you will wish to memorise the whole Quran. 7) INCLUDE IT IN YOUR PRAYERS. You can recite the verses you memorised in your daily five prayers. You can also include the verses in your supplications. 8) DON’T THINK OF THE QURAN AS JUST A BOOK OF PRAYER. If you view the Quran as just a book of prayer, your love will be limited and it will be based upon selfishness. So observe the Quran from different angles, for example as a book of prayer, a book of guidance, a book of justice, a book of legislation, or a book of science. The more you observe it from different perspectives, the more you will fall in love with it. All the above facts will be useless if you are not living by the Quran. So take every piee of advice it provides: tips that motivate, words that inspire, skills that help, and warnings that will lead you to the correct course. Take these all into yourself and live by the Quran. Become a walking Quran, like Rasoolullah did. Strengthen your faith by remembering Allah often, because faith is where love comes from. The deeper your faith, the deeper you will be in love with the Quran. So be steadfast in your faith and feel the difference. HOW CAN WE KNOW THAT WE ARE IN LOVE WITH THE QURAN? You will have a feeling that Allah is very close to you. You will sense His presence and it will gradually develop your closeness to Him. Your individual traits will reflect positivity and there will be a great improvement in your character. You will be happy and satisfied with what you are. Tranquility will surround you and you will be ease at heart. 4) ENCOURAGE GOOD AND FORBID EVIL. You will be conscious of evil without falling into a pit of sin and will encourage yourself to do good deeds. You will do the same when you come across a person; you will prevent him from doing sins and will motivate him to perform good deeds. You will be full of hope, and even if you didn’t receive what you had intended to receive, you will still be hopeful of receiving a reward in the hereafter. You will attain success in everything you do. Even if you didn’t get it instantly, you will see it in the latter part of your life, or you will be sure that it will be hoarded to make you successful in the hereafter.